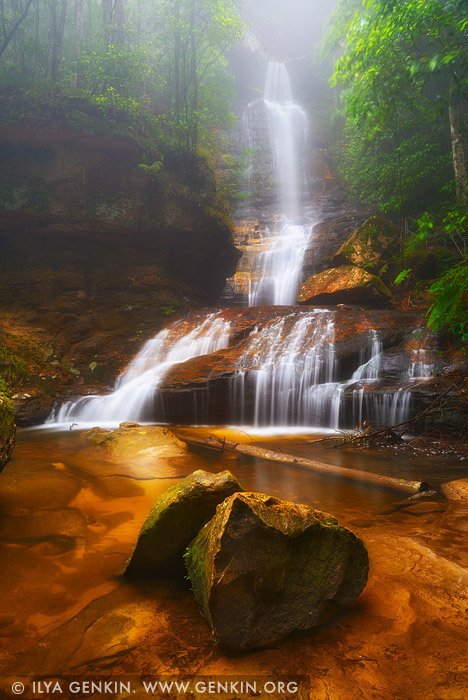 Rainy and misty weather made Empress Falls and surrounded area glowing in the Sun rays. Empress Falls is one of the many waterfalls in the Valley of the Waters Creek in Blue Mountains National Park, NSW, Australia. This image id AU-EMPRESS-FALLS-0003 of Empress Falls, is copyrighted © by Ilya Genkin. This is not a public domain image.